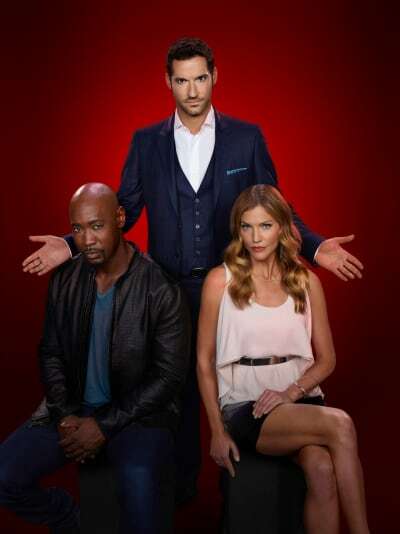 Lucifer Q&A: Tricia Helfer on Mommy Issues, Being Misunderstood & More! Lucifer and Amenadiel are getting company on Lucifer Season 2. Mom's coming to town, and her "visit" should prove very interesting. Tricia Helfer was beautifully cast in the role, and she took the time to talk with us about what to expect of the "supreme goddess" she's playing, how her sons will react to her escape from captivity and the driving force of her return. Read all about it with our full interview below. TV Fanatic: So what does it feel like to be playing the woman who has had children with God? Tricia Helfer: [laughs] I certainly did think about it when I first was cast. I was like, I'm playing this supreme goddess...you know, trying to figure out the character and everything. But then I sat back and thought, no. You played a robot, you played a serial killer, you know, other things you haven't had experience with, so just go with it! But it's been fun, because the body that mom is in is obviously not her own. It's a human form she had to take to search for her sons in LA, so I'm getting to play with the newness of being in human form and mom also has a serious dislike for humanity, and that also adds to the fun of it. But definitely, playing this supreme goddess was a little daunting at first. I had to assume something didn't go well somewhere along the way, since she was locked away in hell. Yeah, we obviously set things up with the Season 1 finale and we pick things up in Season 2 right away. Their concern and their quest, Amenadiel and Lucifer, kind of almost have to work together for the first time because of their concern for mom being here and escaping hell. They're not only concerned for their own reasons, but also the fact that she really dislikes humanity, so they're concerned, as well, and they're looking out for other people as well as themselves. I was wondering about that, because at the end of Lucifer Season 1, the two brothers were actually getting along, which is something they had never done, and if finding mom had broken out would keep them on that path. Well, it is and it isn't. When we meet mom, we do learn very quickly what most of her agenda is, and I think fans will be surprised that she's just not hell bent on revenge. She is a mother, at the end of the day, who loves her sons and wants to be with them and wants what was taken from her, which will be revealed in the second or third episode, and she's not necessarily down there just to cause a ruckus. She's down there because she loves her sons, and we do find that out rather quickly. There's also been a lot of miscommunication between mom and her sons and the situation that had her banished down to hell and Lucifer guarding her but never having any communication with her while she's there, there's certainly a VERY long time of letting miscommunication brew. That will be dealt with right away, as well, and you'll get to see a very different side to Lucifer as he's learning about and understanding some of the truths he didn't know. You know sometimes parents will shield their children from the truth thinking it's somehow better for their children not to know the whole truth, and there's been some of that going on. It relates to some of their daddy issues from last year because mom was also involved in all of that. So it's not like it's a departure from last year, but it's in addition to last year, which I think fans will appreciate. You touched upon something else I was wondering. Has she been in the loop on their lives? It seems they haven't been in the loop on hers, but was she given information and in the loop on theirs? To the extent that she could, certainly before she was banished to hell. But that was a long time ago, and I think some knowledge was held from her, yes. So I think that was part of her drive, to see her sons and be reunited with then and she quickly finds out that they don't know a lot of what happened and so she has to fill them in. So you're going to get to see a different side of Lucifer and Amenadiel as well, because in some ways, they're taken back to almost being children and seeing things differently, and that's really fun to see. It's certainly fun to play with as an actor, but fun to see. It almost sounds like he may have something in common with his mother, even if he doesn't know it, because he left hell for kind of the same reason. He felt misunderstood and wanted to let the world know he's not the bad guy everybody thinks he is. Yes, and we do get into that right away, a lot of what he was feeling, why he was banished there and why he felt like he was misunderstood has to do with a situation that happened. A lot of his anger with mom is that he thought, without giving too much away, that she didn't necessarily have his back, and that's not the case. There's definitely a familial relationship there and Lucifer does, in many ways, take after his mother. Interesting. So there's a promo out with you dancing all sexily on top of a table at Lux while Lucifer is over at the bar looking on. Is that before or after he knew it was you? [laughs] That is after. I have not seen that promo yes! I probably don't want to see that promo! It was a very fun day on set, that's for sure. With mom being in human form for the first time, it certainly lends itself to some learning and experience that she has to do. She knows all about humanity, but having never spent time down her or spent time in an earthy skin sack, as she likes to call it, there is a learning curve to figuring out what it's like to live down here. And how did she happen to choose your precious body? Well, it's not the first one that she attempted. So I think more just by chance. There were another couple of attempts, but you'll have to wait and see why they didn't end up taking, but it's not like mom specifically chose Charlotte's body, it was just more by chance. And it happened to stick. And probably fit some specific purposes to have fun with her sons! Well, there is some of that, yes. Another son is on his way in Season 2, Uriel. Is he coming back because he heard mom is in town? I don't know how much I can give away, but I would say your along the right track, yes. Well, who wouldn't come home when mom's in town, right? What good is a family reunion without the whole family? Amenadiel seems to be not necessarily following through with his mission, so there may be a little checking up that is being done. That would give Amenadiel a taste of his own medicine, since checking up on Lucifer is why he's there. Yes. Amenadiel has got a great arc this season as well, and he's really getting to explore and learn a lot about himself, at least in this first part of the season where we are now. DB's gotten to do a lot of fun stuff and the audience is going to get to know Amenadiel a lot better and what makes him make the choices he does. So it doesn't sound like she's coming back to punish her children as much as it does she's coming back to have a relationship with them and get to know them. Mom is definitely misunderstood, as well. I know you mentioned that about Lucifer. That's not to say mom doesn't have a dark side to her, but she really is a loving mother who wants to be with her sons and wants what was taken from her. I'll let the episodes air to explain what that really is. That is the driving force behind her agenda. What kind of scenes are you going to have with Maze and Chloe? Well Maze and mom have a history. There is no love lost between these two. Mom was banished to hell for a very long time, and Maze was basically in charge of keeping her locked up. Because Lucifer wanted nothing to do with her at this point, Maze was out to try and get information. Mom is not the type of person to feel threatened by Maze, which I think even further annoys Maze, that mom is not threatened by her. And maybe mom will help mom will help Lucifer realize what's going on with Chloe? Yeah. So far this season, I haven't had much going on with Chloe. I know I'm going to, but I don't know exactly what it is; I haven't read those episodes. But coming up, yes, I know there's something coming up. The first part of the season in terms of mom, there's a lot to do with her sons and also the situation of being in a human body and trying live as Charlotte Richardson and so forth, so mom's kind of got a lot on her plate right now, but as she's being reacquainted with her son, of course she's going to realize that his attention is bespoken in Chloe's direction, and I'm not quite sure what she's going to be doing about it. But that will be coming up kind of mid-way through the season. What's been the most fun for you to do so far that you can say without giving too much away? You know, I really think the character for me has been because she's a very fun character. I was concerned that, "Oh, she's being set up with a very over-the-top evil arch," and I talked with the showrunners before and they said mom was not going to be this one-note arch character, and they have absolutely stuck by their word. So it's been a lot of fun not only to play a very maternal side and dealing with dysfunctional family issues, but also a very quirky fun side to her, and so that's been a lot of fun for me. I don't often get to do comedy, comedy yet with a heart, so that's been a lot of fun for me. It's been a blast working with the cast and crew. It's not always easy coming into a show that's already going and has got its wheels turning like a well-oiled machine, but they could not have been more welcoming to both myself and Aimee Garcia who also came in second season and just immediately up to us and accepted us as part of the family. It's been a very nice experience. Is there anything specific we should look out for to whet viewers' appetites? I think in the second episode, you learn very quickly about mom, so there's a lot of fun and situational comedy with mom and you know, being the same age and kind of surprising them with who she finally is and just being there. But then there are really some heartfelt moments with Tom and you get to see a vulnerable, almost boyish side to Tom, and he does it so well. I think the fans are going to be so drawn into seeing this hurt, little boy side of him.